Hello shoe lovers, are you ready to get retro? We certainly are, especially if we're grooving in these charming mod wedges that celebrate the black and white trend, which of course is still a must. 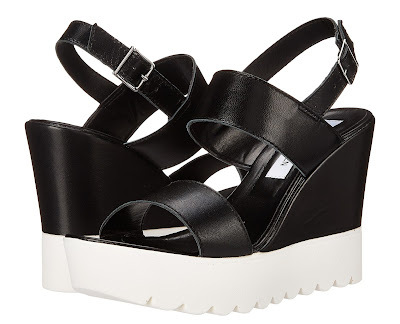 This summer, we definitely have our eyes on snagging a pair of these Steve Madden Chaarm Wedges. Featuring a leather upper, thick, adjustable ankle straps with buckle closure and a sling back strap, open-toe silhouette, and a 5" wrapped wedge with 1 1/2" two-toned platform. What we love most about these is the fact that it reminds us of the very cool black leather Converse sneakers with the thick white soles. If you're looking for a more crisp overall look, these fab wedges also come in all white, also a hot color trend for summer. Grab these now on www.stevemadden.com for only $39.99.